When May is just about to come, you may see people putting up flag-like fishes outside of their homes or inside buildings. That is called a Koinobori. Designed on a large piece of fabric (usually nylon), its etymology means "climbing (nobori). carp (koi)". Let's see why this fluttering fish is so important during this season and what it means in Japan. Just as girls' day is celebrated in March (Hina Matsuri), there is also a day for boys called a "Kodomo no Hi" (Children's Day). On May 5th, boys are the star of the day. But why a carp? Carp are said to have strong life energy and can live in different areas. Also, they appear in numerous ancient legends as strong characters. That is surely why Koi (carp) are s such an important symbol for this day! The carp put up to sway along the streams of wind look powerful and strong; making their way up the sky. By representing the strength and courage of the carp, parents wish for their boys to grow up with these traits. It also is a message to the gods, asking them to bless newborn baby boys. Usually, the black carp is the father, the red carp is the mother, and the smallest one on the very bottom is the child. 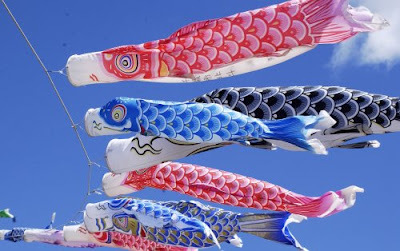 However, the colors are not too important and you can see many different and colorful varieties of Koinobori. The object above the father is there to protect the family from evil. One area where you can view beautiful Koinobori in Japan is at Tatebayashi, Gunma Prefecture. Along the Tsuruudagawa river, which is a 20 minute walk from Tatebayashi Station, the "World's Greatest Village of Koinobori Festival" is held every year. As the festival with the greatest number of Koinobori put up (5283), it was registered in the Guinness Book of World Records in the year 2005. Today, thousands of Koinobori are put up when spring is about to come. When a spring breeze blows through the air, the Koinobori dance along with the wind; makes it look as if they are actually swimming along the river. That sure is a beautiful sight to see!! There are many other areas in Japan that have Koinobori Festivals (e.g. Tsuetate Onsen in Kumamoto, Sagamigawa in Kanagawa, Ryujin Otsuribashi in Ibaraki); so what are you waiting for? Go get some courage and strength from the carps swimming in the air! Nihonbashi, located just north of Ginza is another place where you can enjoy the history of Japan. It is mixed with both the early age of Japan and the modernized Japan in every scene. And I believe that exotic atmosphere is produced by the buildings surrounding the area, around the bridge. The first bridge was wooden and was completed in 1603. It was rebuilt into a concrete bridge in 1911, which is the bridge seen today. It makes it easy to reach Akihabara, Otemachi, Yaesu and Ginza from this part of the city. 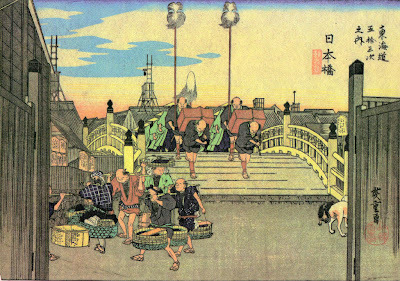 During the Edo period, Nihonbashi was Tokyo's important market place. The Mitsui family established the entire sales market during this time and became the famous Mitsukoshi department store known today. From then on the markets grew in Nihonbashi. One example is the Tsukiji fish market which started in this area. Since then Nihonbashi is one of Tokyo's big business district. You could see Mt. Fuji from Nihonbashi until 1964 when an express way was built for the Tokyo Summer Olympics. To regain this view, the local community petitioned to move the expressway elsewhere. However, the petition was opposed by the former Governor of Tokyo because of its estimated price, JPY500 billion. Crossing the bridge itself is a must-do of Nihonbashi, but there is the must-see of Nihonbashi too. Mitsukoshi department, and COREDO Nihonbashi. They are the two major buildings built in Nihonbashi which come in contrast. 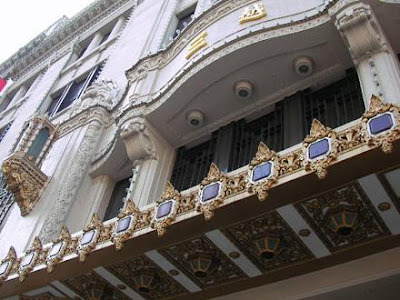 Mitsukoshi has long years of background, and history in its appearance. Where, COREDO is a newly placed building, built in 2004, with nothing but modern all over its appearance. Despite its difference in their appearance, they both have a point in common, magnificence. In Mitsukoshi, you can enjoy the magnificence of the building and its kimono sales section occupying the 4th floor. Nihonbashi has been known for its kimono business since 1673 and Mitsukoshi has been the first department store since 1903. In COREDO, you can enjoy the magnificently modernized design of the glass glazed building and its Michelin starred restaurant on the special floor only for this restaurant, ANNEX floor. Another place where you can visit to enjoy the old and new of Nihonbashi is, the Bank of Japan and Mitsui Tower Nihonbashi. Most of these buildings are built in the early 1900s so you can enjoy the outstanding history of the architecture. Check out the hotels around this area. 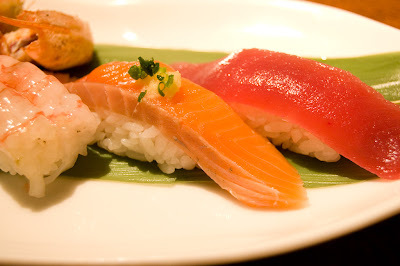 Learning the less common sushi terms at sushi bars will make you look both sophisticated and as if you are a regular of the bar. Akami - Lean tuna. A fishes' red parts. Often used for maguro. Agari - Green tea. Agari means "goal" in Japanese board games, and since you usually drink tea at the end of a meal, the term is used. Geta - The board where you put the sushi on. This is because the board looks like the wooden sandal, geta, worn by the ancient Japanese. Gari - The ginger placed on the side. It is called gari because it makes the sound "gari gari" in your mouth. It's eaten to refresh your mouth after each sushi, like those coffee beans at perfume stores. Murasaki - Soy sauce. Murasaki also means purple and because the color of soy sauce looks like a deep tone of purple it is called murasaki. Nama - Raw. Used as a prefix to the name of a fish, a shell fish (like oysters), or something usually cooked. Odori - Alive. Odori normally means dance in Japanese. When the fish is sliced just right to eat alive, it jumps around and since it looks like as if the fish is dancing it is called odori. Sabi nuki - No wasabi please. Sabi is an abbreviation for wasabi. "May I have an akami-sabinuki,-with a little bit of gari on the geta." "May I have cod fish's odori and nama-oyster with murasaki and wasabi on the side?" Tokyo might not be the only destination for sightseeing and business. For those who are on honeymoons and who come with their loved ones, I am going to be introducing the best date plan to take your loved ones on! Today is dating in Yokohama. Yokohama is in Kanagawa prefecture, the next door neighbor of Tokyo. It is not so far away and there are so many outstanding things to enjoy. I recommend this "Take a walk by the sea date". You start at the East exit of Yokohama station and take the Sea Bus (Adult 700yen Child 350yen) to Yamashita Park. During this ride you can see the Ferris wheel and the old buildings of Yokohama. When arriving at the Yamashita Park, you can walk through the park towards the Chinatown area from where you can see the boats at the harbor on the left side, and the hotels on the right. Then have lunch or dinner depending on the time you arrive - in Chinatown. If you are not that into Chinese food, you can eat elsewhere or maybe in the Motomachi area. After leaving Chinatown and heading towards Motomachi, visit Minato no Mieru Oka Park. You can catch some coffee, sit on a bench in the park and get to know each other more. Then after enjoying the park, walk to the Motomachi area. Here, there are restaurants and many stores to shop at, so you can eat or go window shopping and get to know what your date is interested in! After all this talking and walking, you can start going home from Motomachi-Chukagai station. I recommend the Minatomirai 21 area! There is the Yokohama World Porters shop and an amusement park, Cosmo World, where you can get the excitement you need in your relationship. 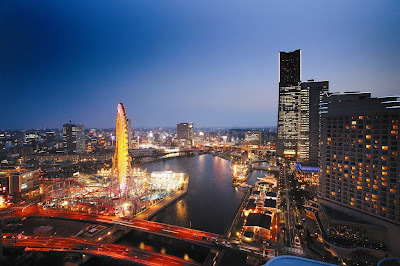 You can always get a hotel by Minatomirai since the area is known for many night spots as well. And for that lost romance in your relationship, you can go to Landmark Tower and enjoy the view from the 69th floor - 273m above the ground. With the magic of this sparkling night view Yokohama city, you could regain your feelings of love for him or her once again. Before the magic disappears, you should escape into the room you have reserved, or go to the Minatomirai station to go home. When you walk through Chuo Street in Ginza you see many world renowned fashion brands lined up along the street. In between these modern buildings stands an old temple like building showing off the history and culture of Japan just by being there. 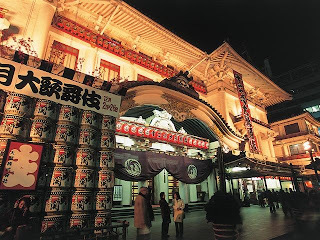 This is Kabukiza, a Kabuki theater located in Ginza. Kabukiza has been renovated many times since its opening in 1889 and is an existing example of Meiji-era architecture. Since its opening, Kabukiza has been the Broadway of Tokyo, a place where entertainment was sold. The first renovation was in 1921 when a great fire occurred. The next one was from 1923 to 1924 when the great Kanto earthquake struck which lead the Kabukiza to be rebuilt. And then, another renovation was in 1945 when it was bombed in World War II. It took five years to renovate over and since its last renovation it has been standing then. Kabukiza has announced a plan to renovate again from 2010 October through March of 2013. This time, it was pronounced to be refurbished into a modern style Japanese castle with a 150m high, 29 floored contemporary building attached to it. Personally, I am not happy with all the modernizations of ancient buildings. These places should be treasured since these are the places where history was made. Because of the renovation, the Kabukiza is performing the Sayonara-koen. This will be the last time to enjoy your trip to the historical Kabukiza that has been around since the 1950s. So before it is torn down and renovated into something very modern, have a trip there just to take pictures. Want to know what the latest trend among stylish young girls in Japan is? 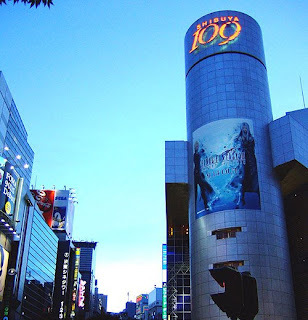 Then visiting the "SHIBUYA109" building (Marukyu) will surely let you know! Walk towards the Dogenzaka intersection from Shibuya station for about 5 minutes and you will see a tall cylindrical building standing tall in the center of a Y-shaped road. Built in 1979, the SHIBUYA 109 is a popular and symbolic shopping mall in Shibuya. SHIBUYA 109 used to be a building with kimono fabric stores and Japanese food - it sure was not the kind of place where young people go to like they do today. It was not until the year 1995 - when an underwear shop named Peach John opened - that SHIBUYA 109 gradually became popular among young people. Soon, more and more outfit shops targeting young girls opened in the building. Simple meals can be enjoyed at the top floors as well. Now, SHIBUYA 109 houses approximately 120 stores and is the place from which girls fashion culture is transmitted from to every corner of Japan. There are several reasons told why this building is called 109. 1. Because the Tokyu Malls Development (TMD) owns the building. In Japanese, 10 is pronounced "To" (similar to "toe") and 9 is pronounced "Kyu". 2. Because the stores are open from 10AM to 9PM. 3. Because there are 109 shops. Why don't you enjoy the fashion trends of young Japanese girls? Stores are open from 10AM to 9PM. And don't forget - 109s are located in Machida (Tokyo), Korinbo (Ishikawa Prefecture), and Shizuoka (Shizuoka Prefecture) as well!